One of the musical highlights at the National Arts Festival very year is the Symphony Concert which takes place at the Guy Butler Theatre at the 1820 settlers Monument in Grahamstown. This substantial and comfortable venue seats 940 and always attracts a full-house for this flagship event. 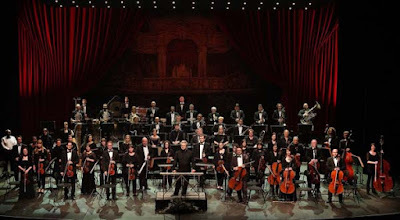 This year, for the first time in six years, South Africa’s oldest Orchestra, the Cape Town Philharmonic, was back at the festival. To celebrate the occasion, they put in a captivating performance which left the audience exhilarated and satisfied. The concert opened with a spirited performance of the popular and charming overture to the opera, Marriage of Figaro, by Wolfgang Amadeus Mozart. The soloist for the concert was Portuguese born South African pianist, Luis Magalhães. He performed Beethoven’s Piano Concerto No. 3 in C Minor The concerto was composed in 1800 and first performed in 1803 with the composer as soloist. It is a dynamic work with plenty of emotional depth, urgency and with a sense of reserved power. Luis Magalhães’ translation showed character and elegance. He has, however, a fairly light touch on the piano and some may have preferred a little more drama and muscle in his performance. The second half of the programme featured Belgium born composer César-Franck’s Symphony in D Minor. This composer’s fame and reputation rests largely upon a small number of compositions, most of them composed toward the end of his life. Of these, the Symphony in D minor was one of his last and best-known works. It was first performed only a year before Franck died. The richly textured work was excellently performed by the orchestra which responded well to conductor Bernhard Gueller’s passionate and inspirational guidance. Gueller is the principal guest conductor of the CPO and has been the music director of the Symphony Nova Scotia since 2002. He has travelled the world widely as a guest conductor.